We are excited to share our school with you! 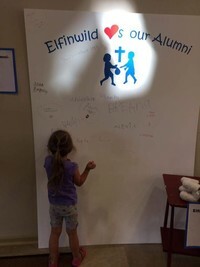 Elfinwild Church Preschool was established in 1981 as a ministry of Elfinwild Presbyterian Church. It continues to be a pleasure and privilege to serve the children of our community and their families by providing a meaningful and positive educational experience in a Christian environment. We believe that all children are special, created by God with unique personalities and gifts. It is with this in mind that we strive to promote the development of the whole child. This includes the nurturing of skills related to motor, cognitive, language, independence and social growth, meeting each child at their own level of maturity and ability. “Why?” is a favorite question of preschoolers! Building on this innate curiosity, opportunities are created for experiential learning that is hands-on and developmentally appropriate. Children are encouraged to investigate, to ask questions and to construct their own conclusions. Tapping into a child’s sense of wonder, activities focus on igniting a child’s creativity and imagination. At Elfinwild we endeavor to instill a love for God and a love of learning.